Why do I smell raspberries? 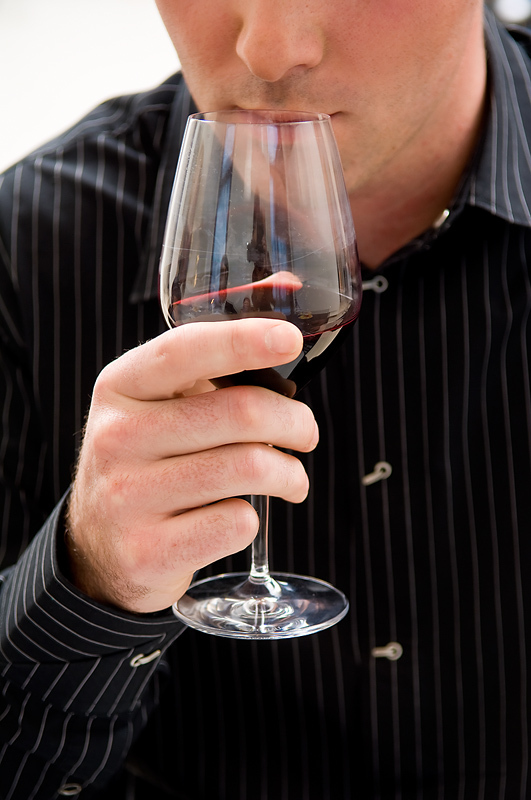 When you swirl the wine in your glass and sniff it, thousands of nerve endings in your nasal cavity transmit the scents to your brain. When you sip and swallow wine, the retronatal passage in the back of your mouth transmits similar information. In essence, the flavors you sense are actually odors in your mouth. Swirling opens up the wine’s aromas and sniffing draws them into the olfactory bulb of your brain, which “decodes” them by comparing them to other familiar smells. This is a complex process, because a wine consists of over 300 different chemical compounds, many of which are identical or similar to those found in fruits, vegetables, spices, herbs, and other substances. So when we describe a wine’s aromas in terms of various fruits, vegetables, herbs and spices such as apple, melon, citrus, cherry, berry, honey, peach, mint, bell pepper, grass, green olive, clove, licorice, cedar, and so on, there actually are chemical correlations. To make opening a bottle of wine more interesting, September Oaks’ consultant vintner Joe Smith suggests that we look for three fruit and three non-fruit scents. And don’t forget that this is completely subjective … SOV’s new Kiwi Gold might smell citrusy to me and berry-like to others. Either way, it is absolutely delicious.